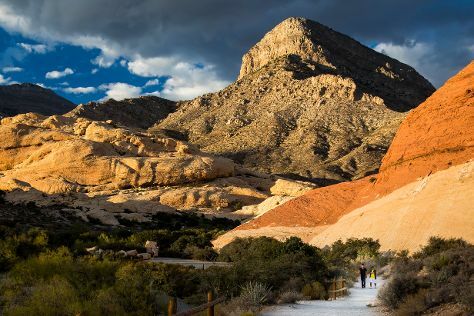 On the 11th (Thu), see the interesting displays at The Mob Museum and then take in breathtaking views at Red Rock Canyon National Conservation Area. Get ready for a full day of sightseeing on the next day: try to win big at Bellagio Hotel and Casino, admire the natural beauty at Bellagio Conservatory & Botanical Gardens, then get a taste of the local shopping with The Strip, and finally don't miss a visit to Bellagio Fountains. To see maps, photos, more things to do, and tourist information, use the Las Vegas travel planner . Chicago to Las Vegas is an approximately 6-hour flight. You can also do a combination of bus and flight; or drive. The time zone difference when traveling from Chicago to Las Vegas is minus 2 hours. Expect much hotter weather when traveling from Chicago in July: highs in Las Vegas hover around 104°F, while lows dip to 81°F. Wrap up your sightseeing on the 13th (Sat) early enough to travel to Los Angeles. Explore Los Angeles' surroundings by going to Anaheim (Disneyland Park & Disney California Adventure Park). Pack the 13th (Sat) with family-friendly diversions at Universal Studios Hollywood. There's lots more to do: see the sky in a new way at Griffith Observatory, make a trip to Walt Disney Concert Hall, take a leisurely stroll along Santa Monica Pier, and see the interesting displays at The Getty Center. For traveler tips, ratings, photos, and tourist information, read our Los Angeles trip planner . Traveling by flight from Las Vegas to Los Angeles takes 4 hours. Alternatively, you can drive; or take a bus. When traveling from Las Vegas in July, plan for much colder days in Los Angeles, with highs around 83°F, while nights are slightly colder with lows around 66°F. You'll have a few hours on the 17th (Wed) to wrap things up before traveling home.